Ukrainian pilot cosmonaut 1989-2004. After leaving cosmonaut corps in April 2004, assigned as Deputy Chief for the First Administration of RGNII TsPK. Call sign: Skif (Skif - Roman-age tribe). 389 cumulative days in space. Status: Inactive; Active 1989-2004. Born: 1961-02-06. Spaceflights: 2 . Total time in space: 389.62 days. Birth Place: Zolochevsk, Ryasnoye, Kharkov. Colonel, test cosmonaut. Resides in Star City. PERSONAL DATA: Born February 6, 1961 in Ryasnoe, Zolochev district, Kharkov region, Ukraine. Married to Valentina Mikhailovna Onufrienko (nee Ryabovol). Two sons and one daughter. His parents are deceased. He has two older brothers. Yuri enjoys tennis, cooking, fishing, chess, and flying. EDUCATION: Graduated from the V.M. Komarov Eisk Higher Military Aviation School for Pilots in 1982 with a pilot-engineer's diploma. Graduated from Moscow State University in 1994 with a degree in cartography. EXPERIENCE: Upon graduation from aviation school, he served as a pilot and senior pilot in the Air Force. In 1989, he was appointed to the position of cosmonaut candidate at the Cosmonaut Training Center. From September 1989 to January 1991, he underwent a course of general space training. Starting April 1991, he underwent training as a member of a group of test cosmonauts. Starting March 1994, he entered flight training to be the commander of the stand-by crew of the Mir-18 expedition aboard the Soyuz-TM-21 transport vehicle and the Mir Station as part of the Mir-Shuttle program. He has over 800 flight hours and has flown the L-29, SU-7, SU-17 (M1-4), and L-39. Onufrienko has flown twice and has logged a total of 389 days in space. SPACE FLIGHT EXPERIENCE: From February 21 to September 2, 1996, he served as Commander on Mir-21. One month later, he and Yuri Usachev were joined by NASA's Shannon Lucid. During Mir-21 he performed numerous research experiments, an participated in six EVAs. He and Yuri Usachev were joined by French cosmonaut Claudie Andre-Deshays after the departure of Shannon Lucid. Altogether, he has logged 193 days in space. Onufrienko again served as Commander on ISS Expedition-4. The mission launched on December 5, 2001 aboard STS-108 and docked with the International Space Station on December 7, 2001. During a 6-1/2 month stay aboard the Space Station, the crew performed flight tests of the station hardware, conducted internal and external maintenance tasks, and developed the capability of the station to support the addition of science experiments. Wearing the Russian Orlan spacesuit, Onufrienko logged 12 hours and 02 minutes of EVA time in two separate spacewalks. The Expedition-4 crew returned to Earth aboard STS-111, with Endeavour landing at Edwards Air Force Base, California, on June 19, 2002. In completing this mission, Onufrienko logged an additional 196 days in space. He is a Lieutenant colonel and lives in Star City. Position: Test-cosmonaut of the Yu.A. Gagarin Cosmonaut Training Center. Place and date of birth: February 6, 1961, village of Ryasnoye, Zolochevsk district, Kharkov region. Parents: Father, Ivan Petrovich ONUFRIYENKO, born 1923, lives in the village on Ryasnoye, Zolochevsk district, Kharkov region. Mother: Yelena Fedorovna Gres, born 1925, died in 1981. Family status: married, wife Valentina Mikhaylovna ONUFRIYENKO (RYABOVOL), BORN IN 1962. Son: Yurity, born 1982; Aleksandr, born in 1990. Interests: aviation and cosmonauts, sports. Honors: awarded two Armed Forces Medals. Work experience: After graduation from the aviation school in 1982, he served as a pilot and senior pilot in the Air Forces. He is a military pilot 3rd class. He was assigned to the Yu.A. Gagarin Cosmonaut Training Center in 1989. From September 1989 to January 1991 he attended the general space training course. From April 1991 to February 1994 he trained for space flight as part of the test-cosmonaut group in the "Mir" orbital station program. From February 1994 to February 1995 he trained for flight as backup crew commander for Mir-18 an "Mir-Shuttle" programs. From March to June 1995 he trained for flight on the Mir station for Mir-19 and "Mir-Shuttle" programs as the commander of the backup crew. At present he is training for space flight in the Soyuz TM transport vehicle and the Mir station as commander of the main crew for Mir-21 and "Mir-NASA" programs. Family: Cosmonaut. Country: Ukraine. Spacecraft: ISS, Mir. Flights: STS-71 Mir EO-19, Soyuz TM-23, STS-102 ISS EO-2, STS-108 ISS EO-4, STS-111, STS-111 ISS EO-5. Agency: VVS. Bibliography: 12, 5853. 1961 February 6 - . Birth of Yuri Ivanovich Onufrienko - . Nation: Ukraine. Related Persons: Onufrienko. 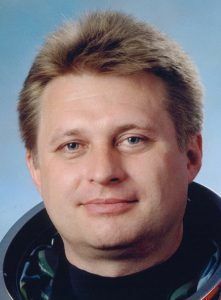 Ukrainian pilot cosmonaut 1989-2004. After leaving cosmonaut corps in April 2004, assigned as Deputy Chief for the First Administration of RGNII TsPK. Call sign: Skif (Skif - Roman-age tribe). 389 cumulative days in space. 2 spaceflights, 389.6 days in space. Flew to orbit on Soyuz TM-23 (1996), STS-108. 1989 April 22 - . Soviet Air Force Cosmonaut Training Group 10 selected. - . Nation: Russia. Related Persons: Krichevsky, Onufrienko, Padalka. 1996 February 21 - . 12:34 GMT - . Launch Site: Baikonur. Launch Complex: Baikonur LC1. LV Family: R-7. Launch Vehicle: Soyuz-U-PVB. Soyuz TM-23 - . Call Sign: Skif (Roman-age tribe). Crew: Onufrienko, Usachyov. Backup Crew: Lazutkin, Tsibliyev. Payload: Soyuz TM s/n 72. Mass: 7,150 kg (15,760 lb). Nation: Russia. Agency: MOM. Program: Mir. Class: Manned. Type: Manned spacecraft. Flight: Soyuz TM-22, Soyuz TM-23. Spacecraft Bus: Soyuz. Spacecraft: Soyuz TM. Duration: 193.80 days. Decay Date: 1996-09-02 . USAF Sat Cat: 23798 . COSPAR: 1996-011A. Apogee: 390 km (240 mi). Perigee: 375 km (233 mi). Inclination: 51.70 deg. Period: 92.20 min. Mir Expedition EO-21. Soyuz TM-23 docked with Mir at 14:20:35 on February 23..
1996 May 21 - . 22:50 GMT - . EVA Mir EO-21-2 - . Crew: Onufrienko, Usachyov. EVA Duration: 0.22 days. Nation: Russia. Related Persons: Onufrienko, Usachyov. Program: Mir. Class: Manned. Type: Manned space station. Flight: Soyuz TM-23, STS-76 Mir NASA-1. Spacecraft: Mir. Installed MCSA solar array..
1996 May 25 - . 20:47 GMT - . EVA Mir EO-21-3 - . Crew: Onufrienko, Usachyov. EVA Duration: 0.24 days. Nation: Russia. Related Persons: Onufrienko, Usachyov. Program: Mir. Class: Manned. Type: Manned space station. Flight: Soyuz TM-23, STS-76 Mir NASA-1. Spacecraft: Mir. Deployed MCSA solar array..
1996 May 30 - . 18:20 GMT - . EVA Mir EO-21-4 - . Crew: Onufrienko, Usachyov. EVA Duration: 0.18 days. Nation: Russia. Related Persons: Onufrienko, Usachyov. Program: Mir. Class: Manned. Type: Manned space station. Flight: Soyuz TM-23, STS-76 Mir NASA-1. Spacecraft: Mir. Multi-Spectral Scanner installed..
1996 June 6 - . 16:56 GMT - . EVA Mir EO-21-5 - . Crew: Onufrienko, Usachyov. EVA Duration: 0.16 days. Nation: Russia. Related Persons: Onufrienko, Usachyov. Program: Mir. Class: Manned. Type: Manned space station. Flight: Soyuz TM-23, STS-76 Mir NASA-1. Spacecraft: Mir. Retrieved and installed material samples. 1996 June 13 - . 12:45 GMT - . EVA Mir EO-21-6 - . Crew: Onufrienko, Usachyov. EVA Duration: 0.24 days. Nation: Russia. Related Persons: Onufrienko, Usachyov. Program: Mir. Class: Manned. Type: Manned space station. Flight: Soyuz TM-23, STS-76 Mir NASA-1. Spacecraft: Mir. Assembled truss. Deployed SAR radar antenna..
1996 September 2 - . Landing of Soyuz TM-23 - . Return Crew: Andre-Deshays, Onufrienko, Usachyov. Nation: Russia. Related Persons: Andre-Deshays, Onufrienko, Usachyov. Program: Mir. Flight: Soyuz TM-23, Soyuz TM-24, Soyuz TM-24 Cassiopee, STS-76 Mir NASA-1. The spacecraft undocked on September 2 at 04:20 GMT, and made a small seperation burn at 04:24:40 GMT. Deorbit was at 06:47:20 GMT. The three modules separated at 07:14:36 and the parachute deployed at 07:26 GMT. The landing was at 07:41:40 GMT, 100 km SW of Akmola in Kazakstan with Yuri Onufrienko, Yuriy Usachyov and Claudie Andre-Deshays aboard. This concluded the French 'Cassiopee' mission. 2001 November 15 - . 2001 November 21 - . ISS Status Report: ISS 01-45 - . Nation: USA. Related Persons: Bursch, Culbertson, Dezhurov, Godwin, Gorie, Kelly, Mark, Onufrienko, Tani, Tyurin, Walz. Program: ISS. Flight: STS-105 ISS EO-3. 2001 November 26 - . ISS Status Report: ISS 01-46 - . Nation: USA. Related Persons: Bursch, Culbertson, Dezhurov, Godwin, Onufrienko, Tani, Tyurin, Walz. Program: ISS. Flight: STS-105 ISS EO-3. 2001 November 28 - . 2001 December 5 - . STS-108 Mission Status Report #01 - . Nation: USA. Related Persons: Bursch, Culbertson, Dezhurov, Godwin, Gorie, Kelly, Mark, Onufrienko, Ross, Tani, Tyurin, Walz. Program: ISS. Flight: STS-105 ISS EO-3, STS-108, STS-108 ISS EO-4. 2001 December 5 - . 22:19 GMT - . Launch Site: Cape Canaveral. Launch Complex: Cape Canaveral LC39B. Launch Platform: MLP1. LV Family: Shuttle. Launch Vehicle: Space Shuttle. STS-108 - . Call Sign: Endeavour. Crew: Bursch, Godwin, Gorie, Kelly, Mark, Onufrienko, Tani, Walz. Payload: Endeavour F17 / Raffaello. Mass: 105,000 kg (231,000 lb). Nation: USA. Related Persons: Bursch, Godwin, Gorie, Kelly, Mark, Onufrienko, Tani, Walz. Agency: NASA. Manufacturer: Boeing. Program: ISS. Class: Manned. Type: Manned spaceplane. Flight: STS-108, STS-108 ISS EO-4. Spacecraft Bus: Shuttle. Spacecraft: Endeavour. Duration: 11.82 days. Decay Date: 2001-12-17 . USAF Sat Cat: 26995 . COSPAR: 2001-054A. Apogee: 377 km (234 mi). Perigee: 353 km (219 mi). Inclination: 51.60 deg. Period: 91.80 min. ISS Logistics flight, launch delayed from November 30 and December 4. Gorie, Kelley, Godwin, Tani, Onufrikeno, Bursch, Walz STS-108 flew the UF-1 Utilization Flight mission to the International Space Station. The UF designation distinguished this from earlier Station flights which were considered assembly flights. The shuttle would deliver the Expedition-4 crew of Onufrikeno, Bursch, and Walz to the station and return the Expedition-3 crew to earth. In addition to the crew swap, UF-1 brought supplies to the Station aboard the Raffaello module, and Godwin and Tani conducted a spacewalk to add thermal blankets to the gimbals on the Station's solar arrays. Endeavour reached an orbit of approximately 58 x 230 km (according to the NASA PAO) at 2228 GMT. At 2259 GMT it fired its OMS engines to raise perigee to 225 km. Mass after OMS-2 was 114,692 kg. Endeavour soft docked with the International Space Station at 2003 GMT on December 7. Problems with aligning the vehicles delayed hard dock until 20:51 GMT, and the hatch was opened at 22:43 GMT. The Raffaello module was unberthed from Endeavour at 1701 GMT on December 8 and berthed to the Unity module of the station at 1755 UTC. STS-108 cargo bay payload was dominated by the Raffaello (MPLM-2) logistics module with 4 RSP and 8 RSR resupply racks. Also in the cargo bay were the MACH-1 and LMC experiment trusses flown under the Goddard small payloads program. MACH-1 was an MPESS-type Hitchhiker bridge carrying the CAPL-3 capillary thermal control experiment on top. On its forward side was the Starshine-2 launch canister, the CAPL-3 avionics plate, the Hitchhiker avionics plate, and the SEM-15 canister. On the aft side was the G-761 canister containing experiments from Argentina, the PSRD synchrotron detector (a prototype for the AMS antimatter experiment which will fly on Station later), and the COLLIDE-2 and SEM-11 canisters. The SEM (Space Experiment Modules) are collections of high school experiments. LMC, the Lightweight MPESS Carrier carried four canisters with materials science and technology experiments: SEM-12, G-785, G-064 and G-730. In addition, an adapter beam on the starboard sidewall carried G-221 and G-775, with materials science and biology experiments. Raffaello was transferred back to the Shuttle payload bay on December 14. Endeavour undocked from the Station at 17:28 UTC on December 15 and made a half loop around the station before making a small separation burn at 1822 UTC. The Starshine-2 reflector satellite was ejected from the MACH-1 bridge in Endeavour's payload bay at 1502 UTC on December 16. Endeavour landed on runway 15 at Kennedy Space Center at 1755 UTC on December 17. The Expedition 3 crew of Culbertson, Dezhurov and Tyurin returned to Earth aboard Endeavour, leaving the Expedition 4 crew of Onufrienko, Bursch and Walz in charge of the Station. 2001 December 6 - . 2001 December 7 - . STS-108 Mission Status Report #04 - . Nation: USA. Related Persons: Bursch, Culbertson, Dezhurov, Godwin, Gorie, Kelly, Mark, Onufrienko, Tani, Tyurin, Walz. Program: ISS. Flight: STS-105 ISS EO-3, STS-108, STS-108 ISS EO-4. 2001 December 8 - . STS-108 Mission Status Report #07 - . Nation: USA. Related Persons: Bursch, Culbertson, Dezhurov, Godwin, Kelly, Mark, Onufrienko, Tani, Tyurin, Walz. Program: ISS. Flight: STS-105 ISS EO-3, STS-108, STS-108 ISS EO-4. 2001 December 9 - . STS-108 Mission Status Report #09 - . Nation: USA. Related Persons: Bursch, Culbertson, Dezhurov, Godwin, Gorie, Onufrienko, Tani, Tyurin, Walz. Program: ISS. Flight: STS-105 ISS EO-3, STS-108, STS-108 ISS EO-4. STS-108 Mission Status Report #08 - . Nation: USA. Related Persons: Bursch, Culbertson, Dezhurov, Godwin, Gorie, Kelly, Mark, Onufrienko, Tani, Tyurin, Walz. Program: ISS. Flight: STS-105 ISS EO-3, STS-108, STS-108 ISS EO-4. 2001 December 10 - . STS-108 Mission Status Report #10 - . Nation: USA. Related Persons: Bursch, Dezhurov, Godwin, Gorie, Kelly, Mark, Onufrienko, Tani, Tyurin, Walz. Program: ISS. Flight: STS-105 ISS EO-3, STS-108, STS-108 ISS EO-4. 2001 December 11 - . STS-108 Mission Status Report #12 - . Nation: USA. Related Persons: Bursch, Culbertson, Dezhurov, Godwin, Gorie, Kelly, Mark, Onufrienko, Shepherd, Tani, Tyurin, Walz. Program: ISS. Flight: STS-105 ISS EO-3, STS-108, STS-108 ISS EO-4. 2001 December 12 - . STS-108 Mission Status Report #14 - . Nation: USA. Related Persons: Bursch, Culbertson, Dezhurov, Godwin, Gorie, Kelly, Mark, Onufrienko, Tani, Tyurin, Walz. Program: ISS. Flight: STS-105 ISS EO-3, STS-108, STS-108 ISS EO-4. 2001 December 13 - . STS-108 Mission Status Report #16 - . Nation: USA. Related Persons: Bursch, Culbertson, Dezhurov, Godwin, Gorie, Kelly, Mark, Onufrienko, Shepherd, Tani, Tyurin, Walz. Program: ISS. Flight: STS-105 ISS EO-3, STS-108, STS-108 ISS EO-4. 2001 December 14 - . STS-108 Mission Status Report #18 - . Nation: USA. Related Persons: Bursch, Culbertson, Dezhurov, Godwin, Gorie, Kelly, Mark, Onufrienko, Tani, Tyurin, Walz. Program: ISS. Flight: STS-105 ISS EO-3, STS-108, STS-108 ISS EO-4. 2001 December 15 - . STS-108 Mission Status Report #20 - . Nation: USA. Related Persons: Bursch, Culbertson, Dezhurov, Kelly, Mark, Onufrienko, Tyurin, Walz. Program: ISS. Flight: STS-105 ISS EO-3, STS-108, STS-108 ISS EO-4. 2001 December 17 - . 2001 December 21 - . 2002 January 4 - . 2002 January 11 - . ISS Status Report: ISS 02-02 - . Nation: USA. Related Persons: Bursch, Onufrienko, Walz. Program: ISS. Flight: STS-108 ISS EO-4. 2002 January 14 - . ISS Status Report: ISS 02-03 - . Nation: USA. Related Persons: Bursch, Onufrienko, Walz. Program: ISS. Flight: STS-108 ISS EO-4. 2002 January 14 - . 20:59 GMT - . EVA ISS EO-4-1 - . Crew: Onufrienko, Walz. EVA Duration: 0.26 days. Nation: USA. Related Persons: Onufrienko, Walz. Program: ISS. Flight: STS-108 ISS EO-4. The spacewalk was made from the Pirs module. Depress was around 2050 UTC, with hatch open at 2059 UTC and egress around 2110 UTC. The astronauts moved the Strela-2 crane from PMA-1 to Pirs and installed it there; the Strela-1 crane was already functional on Pirs. They also installed an amateur radio antenna on Zvezda. On Jan 15 at about 0254 UTC the crew jettisoned two pairs of Orlan spacesuit gloves and a pair of towels used to wipe the spaceuits down, because of concerns about contamination from Zvezda thrusters. They reentered Pirs at 0255 UTC, with hatch close at 0302 UTC and repressurization above 50 mbar at about 0304 UTC. 2002 January 18 - . 2002 January 25 - . ISS Status Report: ISS 02-05 - . Nation: USA. Related Persons: Bursch, Onufrienko, Walz. Program: ISS. Flight: STS-108 ISS EO-4. 2002 January 25 - . 15:19 GMT - . EVA ISS EO-4-2 - . Crew: Bursch, Onufrienko. EVA Duration: 0.26 days. Nation: USA. Related Persons: Bursch, Onufrienko. Program: ISS. Flight: STS-108 ISS EO-4. The astronauts installed plume deflectors around the Zvezda thrusters and set up some exposure experiments. The Pirs airlock was depressurized probably about 1510 UTC, with hatch open at 1519 UTC; hatch close was at 2118 UTC and repressurization began at 2120 UTC. 2002 February 1 - . ISS Status Report: ISS 02-06 - . Nation: USA. Related Persons: Bursch, Onufrienko, Ross, Walz. Program: ISS. Flight: STS-108 ISS EO-4. 2002 February 4 - . ISS Status Report: ISS 02-07 - . Nation: USA. Related Persons: Bursch, Onufrienko, Walz. Program: ISS. Flight: STS-108 ISS EO-4. 2002 February 8 - . ISS Status Report: ISS 02-08 - . Nation: USA. Related Persons: Bursch, Onufrienko, Walz. Program: ISS. Flight: STS-108 ISS EO-4. 2002 February 15 - . 2002 February 20 - . ISS Status Report: ISS 02-10 - . Nation: USA. Related Persons: Bursch, Onufrienko, Tanner, Walz. Program: ISS. Flight: STS-108 ISS EO-4. 2002 February 22 - . ISS Status Report: ISS 02-12 - . Nation: USA. Related Persons: Bursch, Onufrienko, Walz. Program: ISS. Flight: STS-108 ISS EO-4. 2002 March 19 - . 2002 March 21 - . 2002 March 24 - . 2002 March 29 - . ISS Status Report: ISS 02-18 - . Nation: USA. Related Persons: Bursch, Onufrienko, Walz. Program: ISS. Flight: STS-108 ISS EO-4. 2002 April 27 - . 2002 May 4 - . 2002 May 10 - . ISS Status Report: ISS 02-23 - . Nation: USA. Related Persons: Bursch, Onufrienko, Walz. Program: ISS. Flight: STS-108 ISS EO-4. 2002 May 17 - . 2002 June 5 - . STS-111 Mission Status Report #01 - . Nation: USA. Related Persons: Bursch, Cockrell, Korzun, Lockhart, Onufrienko, Perrin, Ross, Walz, Whitson. Program: ISS. Flight: STS-108 ISS EO-4, STS-111, STS-111 ISS EO-5. 2002 June 6 - . 2002 June 7 - . STS-111 Mission Status Report #05 - . Nation: USA. Related Persons: Bursch, Cockrell, Korzun, Lockhart, Onufrienko, Perrin, Walz, Whitson. Program: ISS. Flight: STS-108 ISS EO-4, STS-111, STS-111 ISS EO-5. 2002 June 8 - . STS-111 Mission Status Report #08 - . Nation: USA. Related Persons: Bursch, Cockrell, Korzun, Lockhart, Onufrienko, Perrin, Walz, Whitson. Program: ISS. Flight: STS-108 ISS EO-4, STS-111, STS-111 ISS EO-5. STS-111 Mission Status Report #06 - . Nation: USA. Related Persons: Bursch, Cockrell, Korzun, Lockhart, Onufrienko, Perrin, Walz, Whitson. Program: ISS. Flight: STS-108 ISS EO-4, STS-111, STS-111 ISS EO-5. 2002 June 10 - . STS-111 Mission Status Report #11 - . Nation: USA. Related Persons: Bursch, Cockrell, Korzun, Lockhart, Onufrienko, Perrin, Walz, Whitson. Program: ISS. Flight: STS-108 ISS EO-4, STS-111, STS-111 ISS EO-5. 2002 June 11 - . STS-111 Mission Status Report #14 - . Nation: USA. Related Persons: Bursch, Lockhart, Onufrienko, Perrin, Walz. Program: ISS. Flight: STS-108 ISS EO-4, STS-111, STS-111 ISS EO-5. 2002 June 12 - . STS-111 Mission Status Report #15 - . Nation: USA. Related Persons: Bursch, Cockrell, Korzun, Lockhart, Onufrienko, Perrin, Shepherd, Walz, Whitson. Program: ISS. Flight: STS-108 ISS EO-4, STS-111, STS-111 ISS EO-5. 2002 June 13 - . 2002 June 14 - . STS-111 Mission Status Report #20 - . Nation: USA. Related Persons: Bursch, Cockrell, Korzun, Lockhart, Onufrienko, Perrin, Walz, Whitson. Program: ISS. Flight: STS-108 ISS EO-4, STS-111, STS-111 ISS EO-5. STS-111 Mission Status Report #19 - . Nation: USA. Related Persons: Bursch, Cockrell, Korzun, Lockhart, Onufrienko, Perrin, Walz, Whitson. Program: ISS. Flight: STS-108 ISS EO-4, STS-111, STS-111 ISS EO-5. 2002 June 21 - .